Now this is the actual commencement of the work under the Smart city project. The Belagavi smart city limited has floated tender for Construction of two check weirs (Small Dams) in heritage park worth Rs. 3,80,35,711.50 in a time of 9 months. The existing Vaccine Depot in Belagavi is considered as the green lungs of this place and it’s also very rich in its heritage background. There are in and around 55-57 very elegant historical structures made by the Britishers. Since Independence most of these buildings are being used by the State health dept. as their office buildings and some quarters for their govt. employees. But around 18-20 buildings are lying vacant in a very dilapidated state. Many of these blocks still have lot of potential for specific use (like for children’s activity based program, museum. A heritage guest house etc.) after proper conservation and restoration. On 06 July 2009, Karnataka State Government passed a resolution AKUKA 84 CGM 2009 to use the Vaccine Depot Grounds as a Botanical Garden and Heritage Park. Therefore, it is proposed to plan and develop the entire heritage park into an amusement park under this Smart city mission. There is a natural storm water stream or nallah in Heritage Park which is crossing through the park almost dividing the park into two halves. This is a seasonal nallah.Heavy rains causes flow in this nallah in monsoon period and afterwards the nallah again goes dry and the storm water drains of unutilised. The idea is to create a water body by collecting and storing the monsoon rain water by creating obstruction or check Weir to store water, so that water can be used for different recreational and landscape purpose through the year in this park. This also enhances a rich biodiversity in the park. The presence of a water body will improve the bird population and also enhance the numbers of the visiting migratory birds. For this purpose, it is proposed to build two check Weirs in the most suitable spots on the nallah route. The existing nallah route is very dry and the banks of the nallah are unprotected. Many trees and bushes are grown all along the nallah route as shown in figure 2.2. During monsoon, a heavy water flow is observed in the nallah but after monsoon is completed, the storm water in the nallah are drained out and again goes dry. The Heritage projects within the ABD area under the SMART city component includes. The extent of Heritage Park is 156 acres. 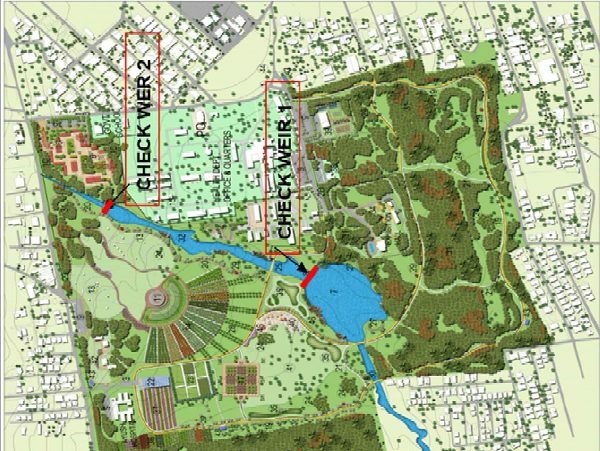 As the proposal is to create a water body, a check Weir has to be constructed to create a recreational spot adding to the Aesthetic value of the park. The location or selection of the check Weir also depends upon other play activities for children by creating an Adventure village housed within some 10-12 historic structures in the park. This adventure village is located right next to the stream and it comprises of play activities such as tree climbing & rappelling, rope climbing, tree houses etc. The water body provides an exciting back-drop to the children’s activities. The detail of the same activities has already been elaborated in “Landscape architecture concept plan of Heritage Park”. Topography of site for weir shall always be preferable to construct at narrow valley and based on this criteria two locations have been identified, which are well suited as per topography and compatible with Children Park and other activities of Heritage Park. more water for a longer period and an additional check Weir is also incorporated into the system at downstream. The Weir -2 location is topographically well suited, but there are some local colonies of health department and people are staying there. Therefore weir location will be covered by retaining wall. Water pounding in this nallah will also increase the ground water table. There is a natural storm water stream or nallah in Heritage Park which is crossing through the park almost dividing the park into two halves. Belagavi is situated near to coastal region and attracts huge rain in monsoon season. Monsoon season is quite long almost from May to September. Heavy rains causes flow in this nallah in monsoon period and afterwards the nallah again goes dry and the storm water drains of unutilised. Therefore, as this project is to recreate the forested area into a beautiful forested heritage park, the idea is to create a water body by collecting and storing the monsoon rain water by creating obstruction or check Weir to store water, so that water can be used for different recreational and landscape purpose through the year in this park. This will not only create a good ambience in the park attracting visitors of all age group, but it will also enhance and enrich its already rich biodiversity in the park. The presence of a water body will improve the bird population and also enhance the numbers of the visiting migratory birds. For this purpose, the proposal is to build check Weirs in the most suitable spots on the nallah route.